Long before the Teatro di Marcello (Theatre of Marcellus) was completed, tragedy and drama had already played out at this open-air theatre in Rome. Teatro Marcello was the plan of Julius Caesar but he was murdered in 44BC and the construction of the theatre remained incomplete. When Emperor Augustus inherited the project, he named it after his nephew Marcus Marcellus, but the young Marcellus died in 23BC before the Theatre of Marcellus was finished. Teatro Marcello was finally completed in 13BC and was inaugurated by Emperor Augustus. It had capacity to hold 11,000 spectators and locals and visitors were able to watch drama and singing performances in the theatre. Teatro Marcello is huge, even by today’s standards, and its construction set the stage for this form of architecture in the Roman world. 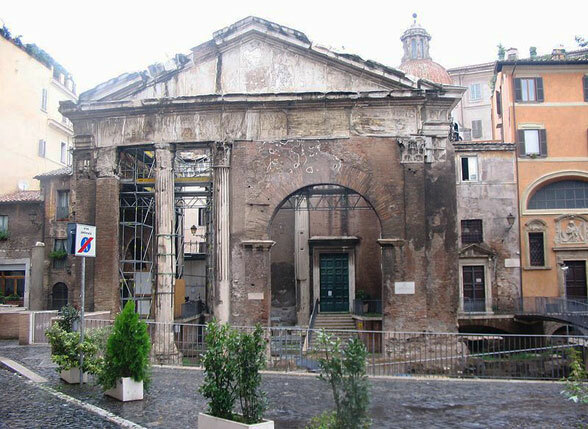 Next to the Teatro Marcello is the Porticus Octaviae, the oldest quadriportico or four-sided porch in Rome. This was built by Emperor Augustus who named it after his sister Octavia Minor or Octavia the Younger. Supported by 300 columns, this vast rectangular portico, included within its colonnaded walks the Temples of Jupiter Stator and Juno Regina, numerous statues and a library erected by Octavia in memory of her son Claudius Marcellus. From the Middle Ages until the end of the 19th century, this once grand portico was used as part of the city’s fish market. The annexed Sant’Angelo in Pescheria church (St Angelus in the Fish Market) is reminder of the fish market function of the portico. In the early Middle Ages, the Fabii patrician family used the Theatre of Marcellus as a fortress. 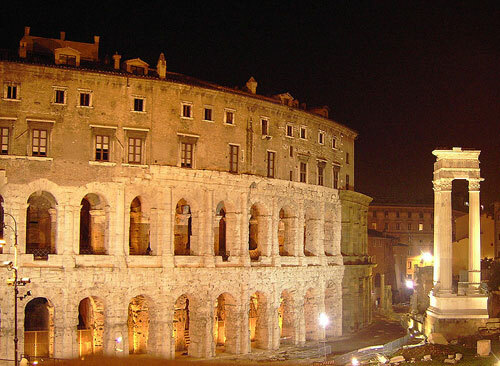 In the following centuries, Teatro Marcello was occupied by a succession of rich and aristocratic families and was also converted into a Renaissance palazzo by Baldassare Peruzzi. Centuries on, the classical form of the Teatro di Marcello not only left its influence on Roman architecture but also influenced architects like Sir Christopher Wren. Wren’s design of the Sheldonian Theatre in Oxford was influenced by this ancient Roman edifice. Today’s visitors to the Teatro di Marcello, can see the different layers of history in this magnificent structure. The high arches of the ancient theatre are topped by medieval fortified walls and then there’s the more elegant aspects of the Renaissance palazzo. In the summer months, you can enjoy classical concerts in this historic venue. See what’s on in 2019 and book your concert tickets HERE. The Area Archeologica del Teatro di Marcello is situated in Rome on Via del Teatro di Marcello 44, downhill from the Capitol, on the way to the Mouth of Truth.